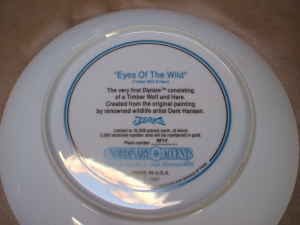 theAd>> This is a brand new Derk Hansen Plate "Eyes of the Wild, I had in the closet, its dated 1987 numbered 9874 has certificate, and box great gift for the holidays coming up. Brand new. 21 years old is not new, it is not antique...It is just old. Being in a box does not make it new. Do you think this is a great gift because in 1987, when you were going through you "Lone Wolf" phase, your mom bought this on QVC and you thought it was a great gift? Then you met the woman who would become your wife [ending the "lone wolf" nonsense]. She laughed at your plate, called it lame and prompted you to put it in the closet until now. I see two options. Take it down to your beige office cube, hang it proudly and take back your identity or...donate that hideous plate and thank your wife for saving you from your horrible taste. 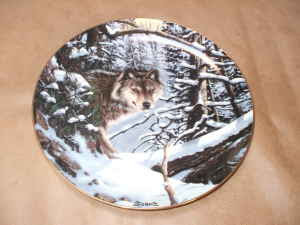 Haahhaaha I've seen these plates decorate the typical hunting cabin.